Sons of Perdition's third album, Trinity, is going on pre-sale tomorrow (October 29). It will be available on CD Baby, iTunes, Amazon, special order from your local music store, and pretty much everywhere else. The release date is November 12. You'll be able to download the album on the release date. If you order it on CD, it should arrive by this date. International orders may take a bit more time due to shipping times. We're working out a few bugs with the ordering system on www.sonsofperdition.com, so it may or may not be immediately available here tomorrow. All CD copies will include a tarot card specially created for the release by celebrated illustrator Christoph Mueller. Trust me, it's really nice. 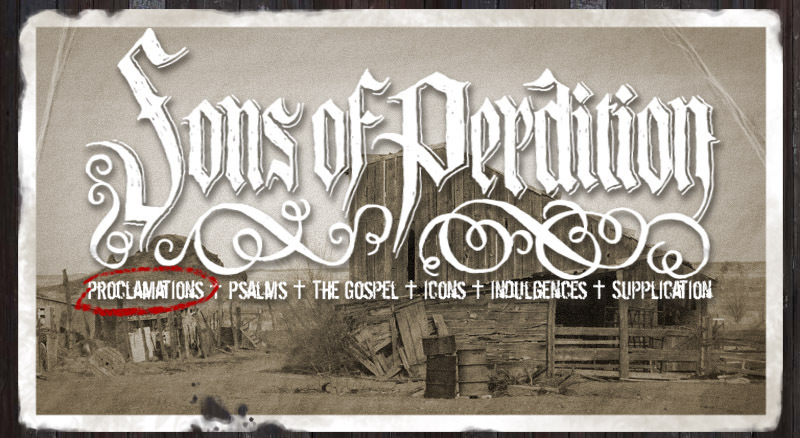 If you order the CD through sonsofperdition.com (once we get that working), you'll be able to download MP3's of the album on the release date by entering the code you're given in your email at sonsofperdition.com. Lastly, we've had to postpone a free secret show that we had planned for the woods of Austin on October 30. Unfortunately, the weather is practically guaranteed to take a turn for the worse on that night. We'll reschedule this for a date in the very near future because we were really looking forward to it. To keep updated on these sorts of things, you can find us on Facebook.